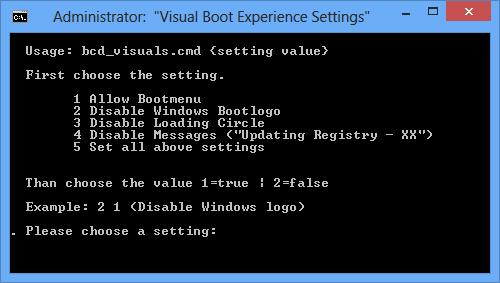 In Windows 7 it was only possible to hide the whole Boot Experience (bootux). Now Microsoft has given some more option for a more flexible Branding. unfortunately this time the they also didn’t build in an option for a custom Bootlogo. Extracted from the Embedded Environment here are some tweaks for the Boot Experience. To manage this settings in an easy and flexible way, I wrote a little script. If you run the script you can choose what you may want to hide or to show. I also added two other options. Disable all visual settings with just one hit (like the bootux value, but as separated objects) and ‘Allow Bootmenu’ which can users prevent access to the advanced boot options. There are certainly more options which would be worth to mention that were added to the bootmgr, like “HIGHESTMODE” but I haven’t tested them yet well. Cool. You are very clever. 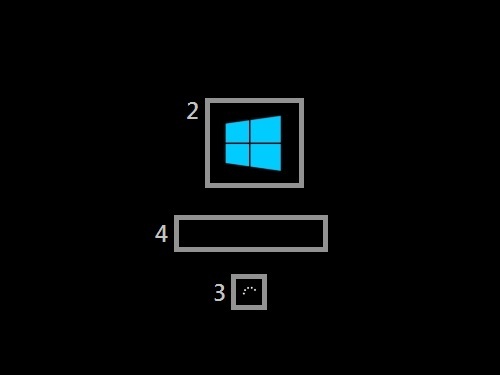 I am glad I can do something about the horrible Windows logo. I am interested in your tool, but I am not so good with batch files. If you were to make a simple batch file, that only removes the bootlogo, what would it look like? Hi, im trying this but its not working, although it says the operation completes successfully. I did manage to disable the loading circle by entering msconfig and checking ‘no gui’ option. Im on a packard bell (ugliest of all logos!) te11 on the basic home windows 8. This than has to do with UEFI and bootmgr settings. The logo you see is from some UEFI specifications. I only tested under normal Bios conditions. Why will this work on the crappy Windows 8 but not 8.1?